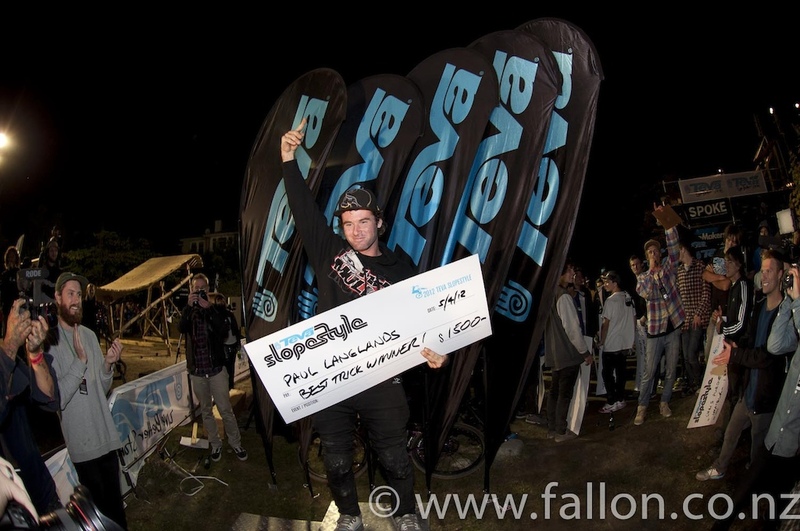 Despite having shot a day and a half of practice on the slopestyle course and having already seen all the riders practice their tricks, I was still blown away by what happened tonight at the Teva Slopestyle and Best Trick finals. Once again the weather was absolutely perfect – blue skies and not a breath of wind. I turned up around 5pm to shoot the final hour or so of practice before the finals started. Right from the start of this final practice session, even before the big crowds turned out, the riders were buzzing and the atmosphere was electric. The boys had the course groomed to perfection ready for today's practice session. What impressed me most I guess was how all the young Kiwi riders stepped up their riding to the next level today. I had expected Sam Dueck and Benny Phillips to dominate and thought the other riders might not be able to even come close to them, but boy was I wrong. Benny and Sam rode super-strong and threw down some big tricks but young Kiwi riders like Lewis Jones, Elmo Cotter and Phil McLean were right up there with them all night and attempted and pulled off tricks they’d never even landed on dirt before. I think it was Lewis Jones who had never pulled a back-flip off on dirt before, but he chose tonight and the most monstrous wood-to-dirt booter to attempt it on. At night and under lights too! Anyway, despite never having landed one on dirt before he pulled off his first backy smooth as silk and was throwing them down, progressively larger I might add, all night long after that. 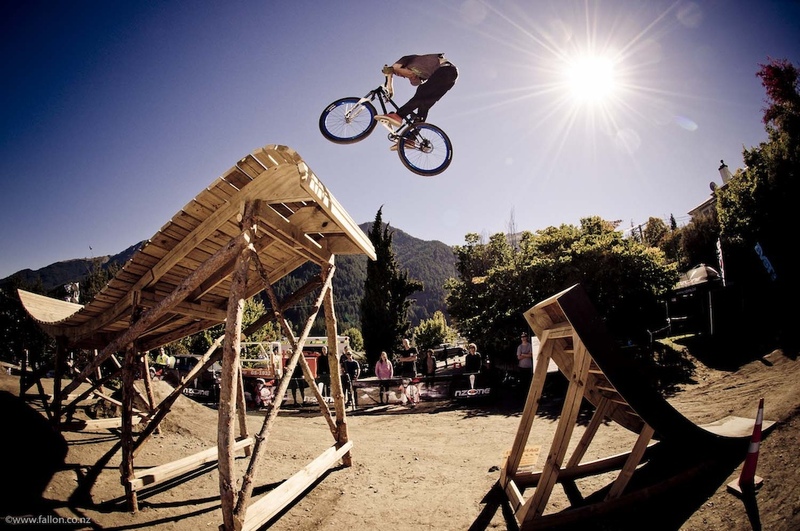 Sam Dueck, tail-whip on the final trick-booter and Local (Wanaka) lad Elmo Cotter, no foot can at the 2012 Queenstown Bike Festival Teva Slopestyle. Phil McLean was also on fire and was attempting double tail-whips on the trick booter. He didn't quite land them but he was rolling away from the landing and I reckon it won’t be long before he’ll be able to pull them off all day long no bother at all. 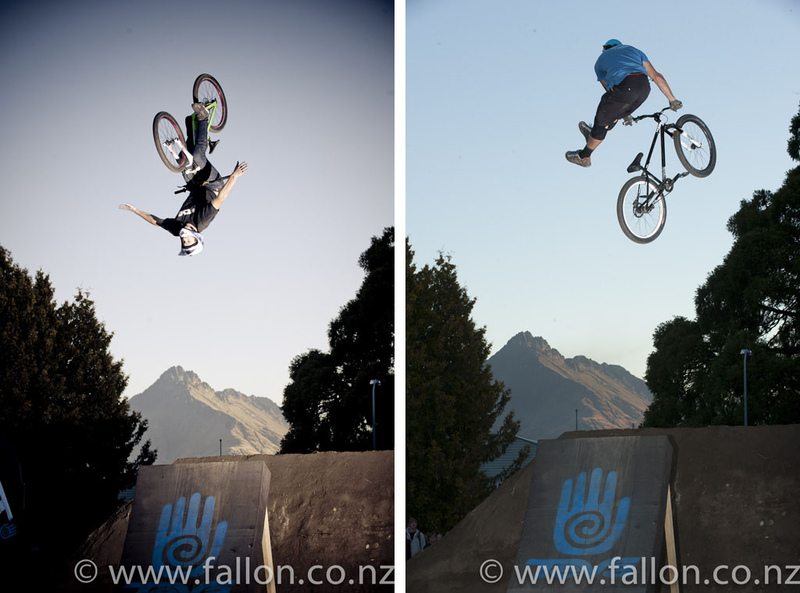 Local (ish – he lives an hour from Queenstown) lad Elmo Cotter was also looking super stylish all night and pulled off some super smooth and slow corked back-flips amongst a host of other tricks. 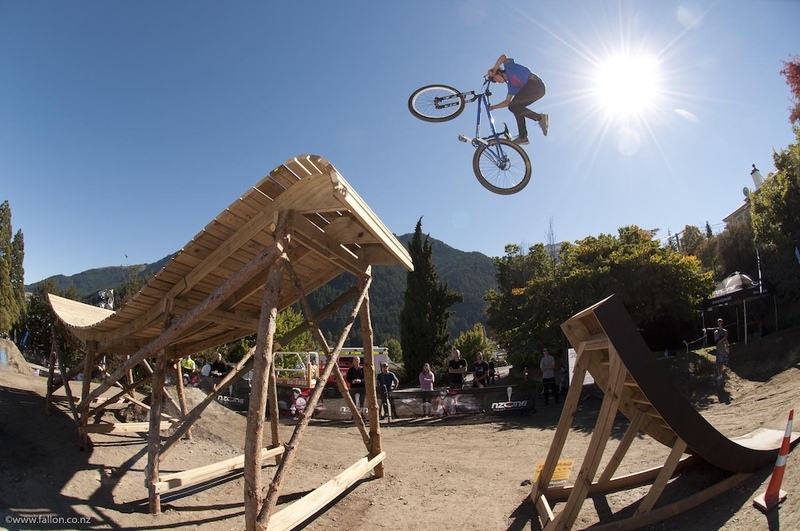 Local ripper (and part of the Wakatipu Shore crew) Conor MacFarlane was also dominating – he was one of the only kiwis to tail-whip the start-ramp step down I believe, and was pulling tech tricks left right and center. 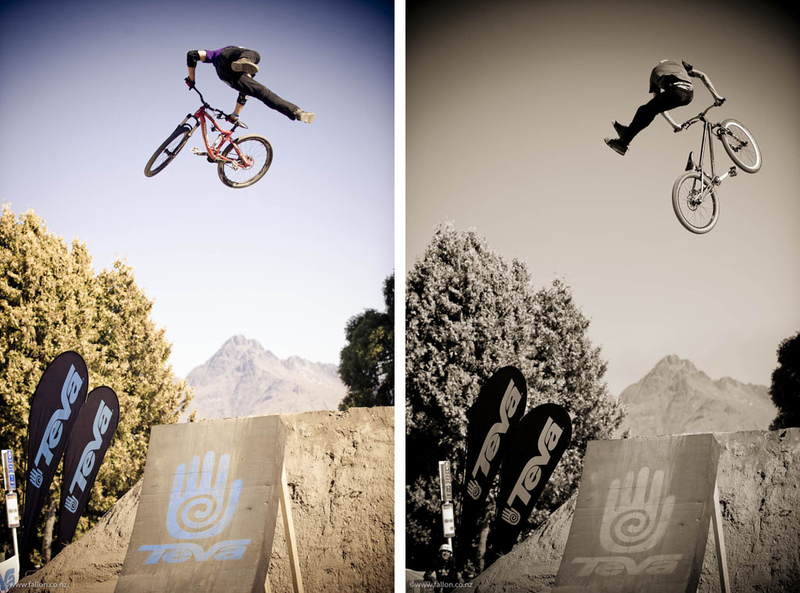 Style for miles, Christchurch ripper Phil McLean with a slow n stylish tweaked 3. 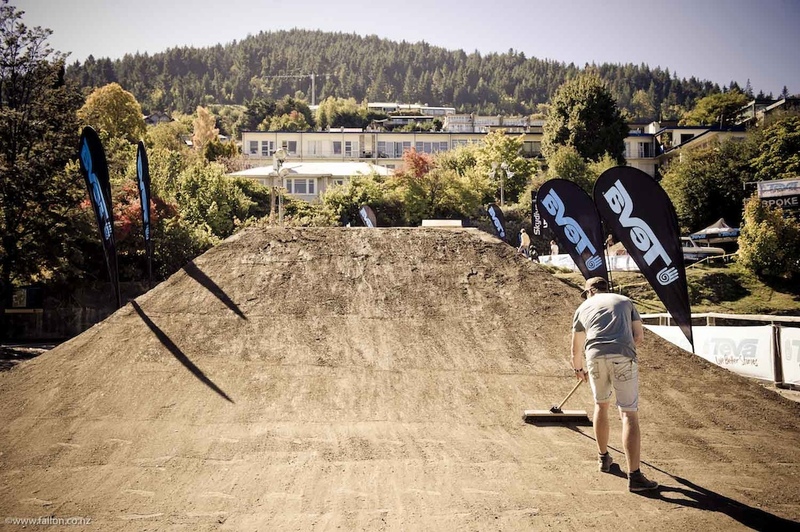 The BMX division, Paul Langlands and Jed Mildon were also representing with back-flip turn downs, flip whips, front super flips, double backy's, you name it. 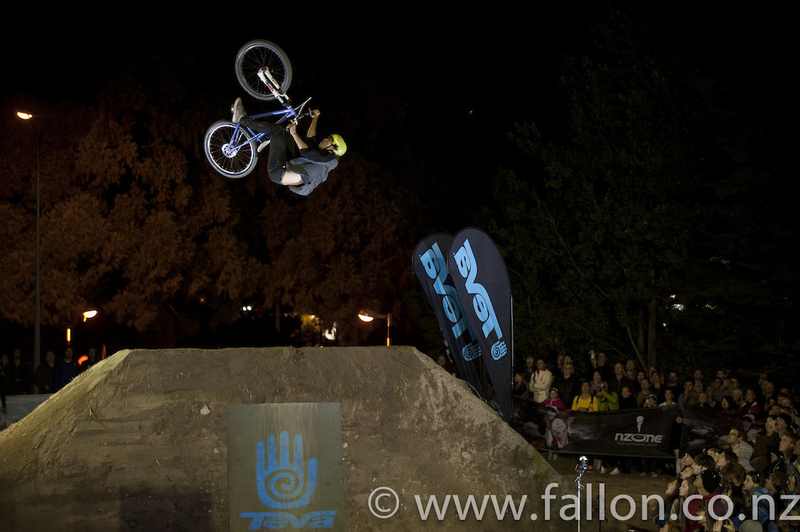 But anyway, I can't do justice to every rider and every trick or I'll be here all night... Kiwi BMXer Paul Langlands won best trick by throwing a trick that no-one else has ever done and I don't even know what it's called. I had to look it up and apparently it's called "the crondog". 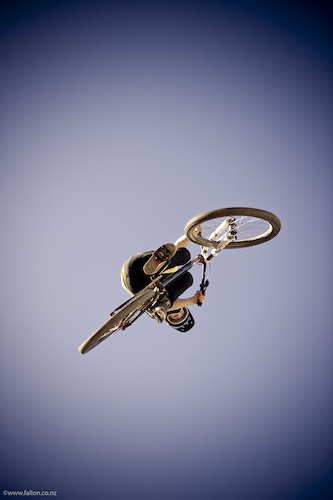 It's a 360 body rotation around the bike - with one hand off for a bit of added challenge. Wrap your brain around that one! Results in the pro category were Benny Phillips (AUS) first, Conor MacFarlane second, Elmo Cotter third, Lewis Jones fourth and McGazza fifth. 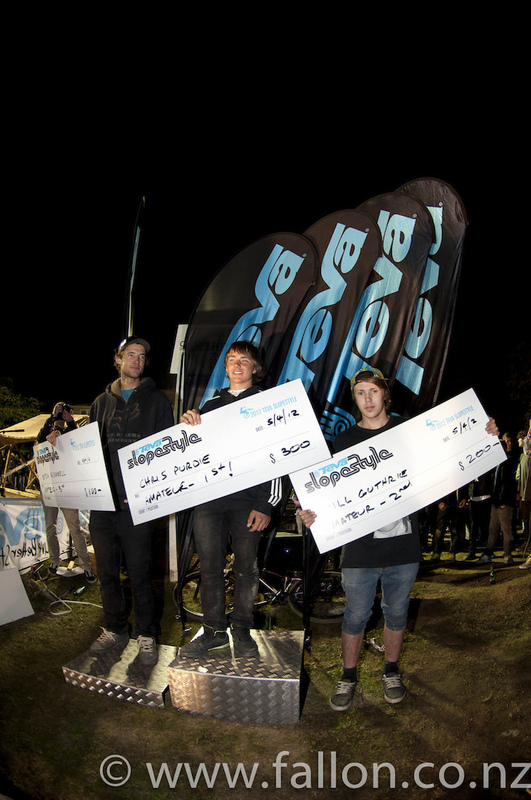 In the amateur category Chris Purdie was first, Will Guthrie was second and Mitch Scammell was third. Anyway, it’s been a bloody long week and I’m sure I’ve forgotten a few important names and details but that’s the gist of what went down tonight. 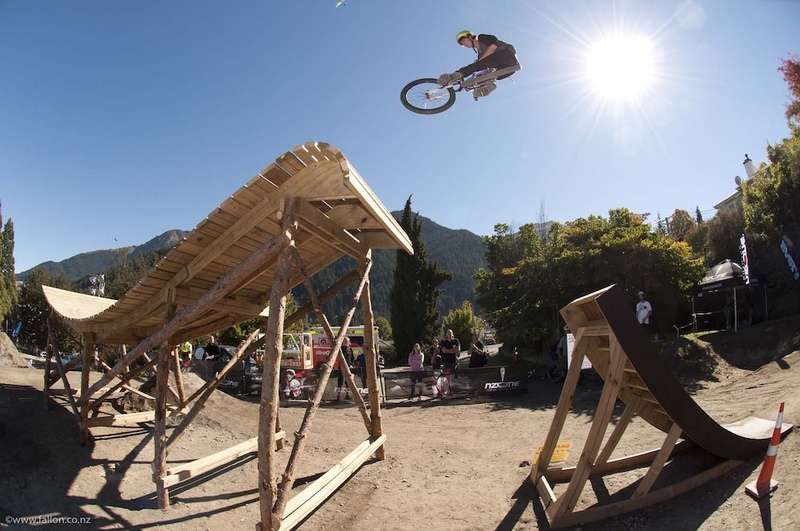 The Teva Slopestyle and best trick was a huge success, the crowd loved it, it’s awesome for Queenstown, the media (speaking for myself at least) loved it. But I can’t help but think that the riders loved it more than the rest of us put together –and that to me is the sign of a successful event. For some of these young Kiwi riders this must have been the night of their lives – they got to ride and hang out with some top pros (who were chilled, friendly and super supportive I might add), they got to ride an international standard slopestyle course, they got to throw down in front of a huge and enthusiastic crowd, and they stepped it up to the next level and destroyed the Teva Slopestyle course!! It was awesome to watch. Love you Aiden for that comment! 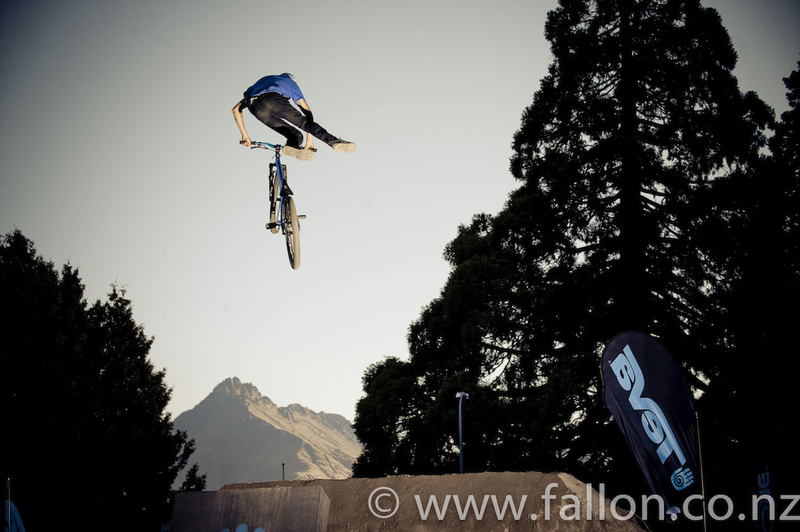 Yeah Queenstown! I'm an expat from nz and I am so glad to see Queenstown getting some recognition for once! Hopefully a FMB or World cup can be held there! Congrats on the great event! definetly! wish there were more pics of him. how big is Kelly mcMASSIVE? the dude is standing on the ground and is still ruling over benny phillips. Good to see Lewis jones ripping with the big boys! the kid got so much talent! everytime i catch up and ride with Lewis, hes always learnt something new or is going bigger. Hes got a massive future ahead of him. its been awesome to see him grow and progress. So much talent. Yeah i know! 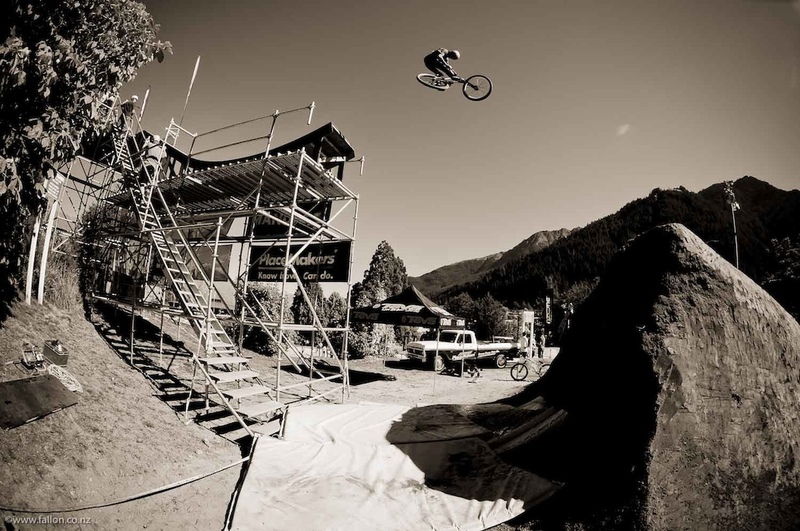 I rode a bit with him at camp of champions this summer.. awesome dude thats for sure! That scaffolding is big enough for Happy Gilmore to make a hole in one. 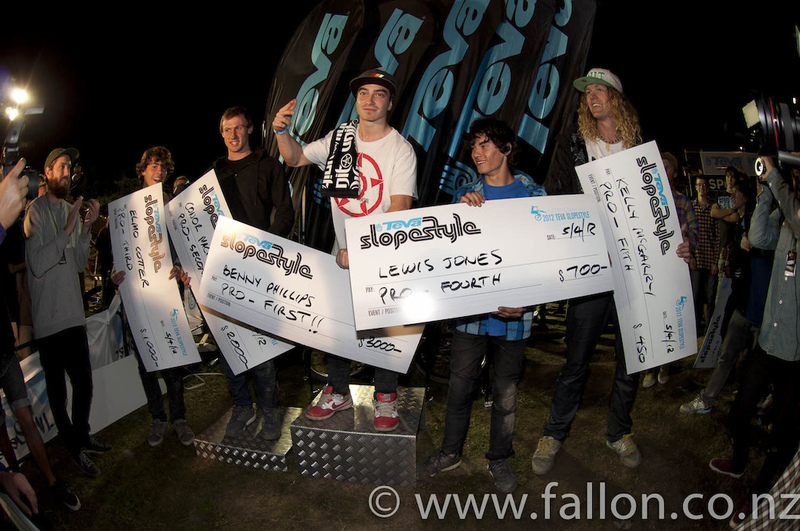 hes the third place winner holding the wrong cheque. Is the "Crondig" a one hander decade? i want to see more Action, we need a Video !!! Sweet!!! Killer pic's. 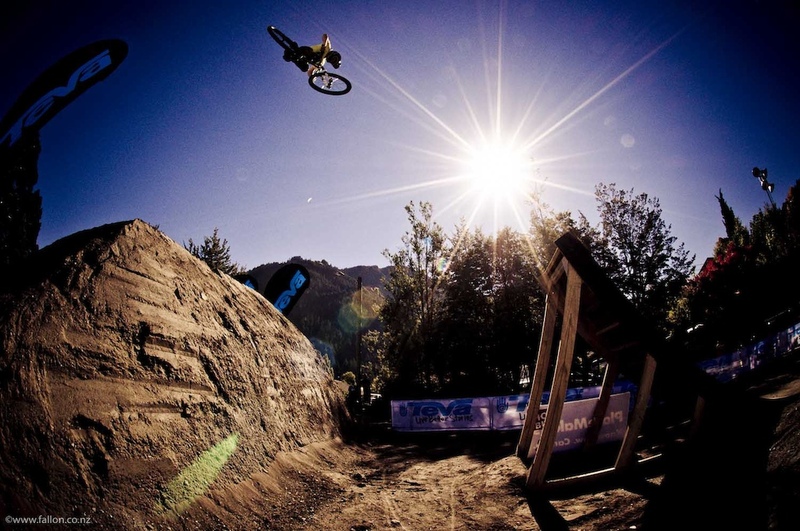 Sick jumps!